which he has also set this year on the Oakland Ballet Company. Co-produced by Tandy Beal & Company and the UCSC Theater Arts Department, and directed by Tandy Beal herself, “Mixed Nutz!” features dancers, circus artists, gymnasts, and vocalists. It maintains the basic story of the traditional Nutcracker: festively dressed partygoers enter for an evening of holiday merriment; young Clara receives a toy nutcracker as a special gift. There are side trips in Candyland, a visit by the Sugar Plum Fairy, a Waltz of the Flowers. The Bay Area’s multi-talented vocal group, SoVoSó with Santa Cruz-based vocalist Lori Rivera, sings Tchaikovsky’s glorious music—a cappella. What makes the show work are many fast-moving events and the spectacular costumes and staging. Among the many surprises are participation by UC student dancers, children of all sizes and shapes, and professional performers who hold it together and move it along. Chinese guest artist acrobat Wang Hong steals the show with her remarkable balancing act; Kerri Kresinski offers a stunning aerial silk performance; newcomer Jasper Patterson of the New Eccentric joins circus artists Iman Lizarazu, Saki, and Jan Damm. In addition Mexican Folklorico dancers from Watsonville’s Corazon en Flor as well as and UCSC’s Los Mejicas hip-hoppers, local gymnasts grace the show. Tandy Beal has made “Mixed Nutz!” a Santa Cruz festival. If you are a parent with a Sugar Plum wannabe in tow, then this is the holiday event for you. For all others, stay away. Once, this event called forth the best efforts of the dance community; dancers of all shapes and sizes danced their dream role, led by dance captains who could rally the troupes. Now, although the San Francisco Lesbian/Gay Freedom Band plays a corny version of Tchaikovsky’s “The Nutcracker” and some chorus line types kick up their heels, the show was primarily a chance for costumed kids to dance in the aisles. For some reason the theme was set on the high seas (a bad effort at staging Cole Porter’s “Anything Goes”?) Let’s return to the days when adults can dance along, too! The program for this show tells us “the story of Nutcracker and the Mouse King becomes the story of Hanukkah.” It just doesn’t work. First, the Tchaikovsky score is too big even for the most professional companies (see reviews of Berkeley Ballet Theater and Oakland Ballet below), much less for a new company with relatively untrained dancers. A klezmer rendition and some real Hanukkah music might work. Next, although the adaptation may have appeal for a special audience (and there is one at the JCCSF), the Hanukkah story needs particular research and historic clarity. It need not and should not follow the E.T.A Hoffmann text. And most of all, mime and pantomime will never suffice to carry a narrative while complex taped orchestral music resounds. The stage, the event, and the story (and what really is the story here?) demands action and real dance/movement. Choreographer Katy Alaniz Rous, while well meaning, has pulled together a good but uneven cast (among whom are Ikola Griffin, Miriam Peretz, and Oreet Shwartz—who had too little to do) and has some charming ideas, but she should take “The Jewish Nutcracker” back to the studio and re-emerge next year with some real substance. Sally Streets and her son Robert Nichols are members of an eminent Bay Area family devoted to dance and theater. For thirty years, Streets has run the school and the company producing dozens of dancers, amateurs and professionals. Now, Ilona McHough carries on the tradition, training at least 400 children and adults in Berkeley every year. For this production of “The Nutcracker,” choreographers Streets and Nichols have introduced a decidedly unique twist to the story: Clara and Fritz are not the comfortable middle-class children of the Stahlbaums; they are homeless. So the tale proceeds, but in this case, every bit of enchantment produced by Drosselmeyer (who seems to be a valet-magician) brings a level of response not often seen. The child performers dominate this production, which is fitting since it is a product of the Berkeley Ballet School. There were several guest artists, members of local dance companies, among them Joseph Copley (Mouse King), Brian Fisher (Fritz), Christopher Hojin Lee, Damon Mahony, and Levi Toney (Drosselmeyer). Best of all it was great to see Brandon “Private” Freeman gracing the stage as the Cavalier and in the grand pas de deux. Freeman has danced brilliantly in the many companies he has graced. But it is the children, who, beautifully costumed and always in good order, perform their charming roles both as dolls, mice and snowflakes and later, in Candyland, as lambs, Pierrots (with Mother Ginger) and flowers. (Their accomplishment was noted in a photo of the lambs and Mirlitons in the New York Times on Dec. 22.) Reid Schnider excelled as an actress and dancer as Clara, Louanne Scordato was charming as the Butterfly and Christina Cherry made a good effort at the grand pas de deux with Freeman as her partner. That long finale to “The Nutcracker” is a tiring tour de force and it should be adapted to help the ballerina shine through her efforts. It would bring a sense of triumph to this otherwise most delightful performance. For 35 years, Ronn Guidi directed the Oakland Ballet, bringing unusual events to the beautiful art deco Paramount Theatre. Now, Graham Lustig of the New Jersey-based lustigdancetheatre, has been appointed artistic director and brought his beautifully designed (by Zack Brown) “Nutcracker” to Oakland. The hometown rejoices! Other costume delights abound, as the Frozen Forest displays the snowflake dancers but also children in round costumes as snowballs. Later in Confiturembourg (land of the sweets) similar costumes are used for lollipops and other goodies. The entertainers from Spain, China, Arabia, Russia, and Germany perform the national dances Tchaikovsky has so well written to glory (in its time) Imperial Russia. Finally, the long pas de deux, this time attempted by Rachel Speidel Little with Jekyns Pelaez as her Cavalier. Lustig softened the piece by giving the talented Steph Salts (Marie) and Connolly Strombeck (Nutcracker) the opportunity to share the stage. Salts and Megan Steffans (Chinese Nightingale) were the outstanding ballerinas. Damon Mahoney, especially on stilts, was an impressive Drosselmeyer. But again, it is the children who steal the show, as it should be. 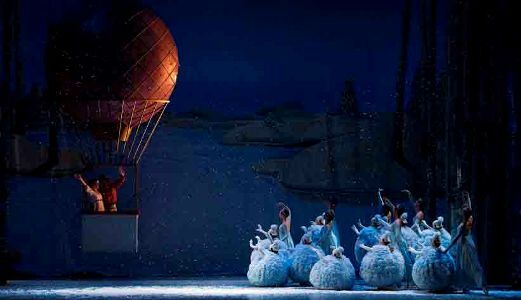 “The Nutcracker” is a children’s fantasy. Michael Morgan and the Oakland East Bay Symphony kept up the tempi; David Elliot did the fine lighting; and Zack Brown once more deserves special applause for the innovative set and costume design. Welcome back, Oakland Ballet!